While not all the participants decided to felt a sleeveless vest I really wanted to get to grips with creating a custom-made template and felt one under Dagmar’s expert supervision. Being accurate with measurements etc. is just not my favourite thing but learning tips from Dagmar about how best to scale up ones body measurements and create personalised templates was a really good exercise for me. I prepared this on Friday evening and weighed out my wool so that on Saturday morning I was ready to start laying out my vest right from the get go. Once again I choose to work with short fibred merino as opposed to one layer of fine needle felt followed by two fine layers of merino tops. This meant that I needed to lay 4 fine layers of wool, for an outdoor vest in my size we reckoned an approximate weight of 360g excluding any optional attachments I might choose to add. 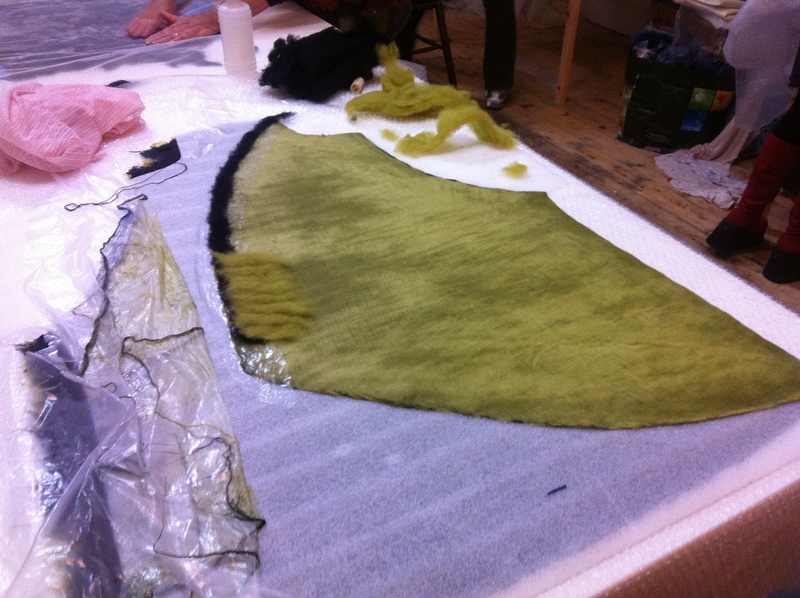 I also had the idea to make my jacket reversible and had a clear idea of how I wanted the colour to be achieved, black on one side (with silk hankies from the wonderful Roo Kline of Moonwood Farm for surface interest) and a complex green with a darker green border on the other ‘main’ side. This I intended to achieve by laying the first layer in black, the second in my favourite green with a black border around the armhole, neck and perimeter areas and the third and fourth layers all in green, I have to say that I’m thrilled with the resultant colour! 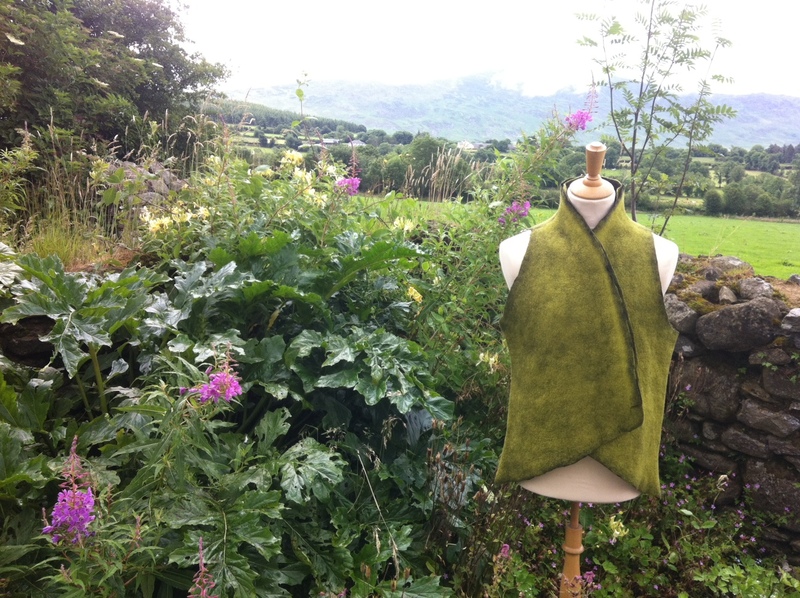 I liked one of Dagmar’s sample vests, it had a cross over front which I thought would be warm for Borris market and Duckett’s Grove in the winter so aside for making it quite a bit longer (to cover my kidneys) the only other design choice I needed to make was what sort of 3D attachments to add. Being someone who likes strong shape and form I opted for a simple detail down the front opening panels continuing around the neckline. I did toy with the idea of pockets but leaving these out meant a totally reversible jacket that doesn’t have bulk at the sides, the final descision was easy, no pockets or frills for me. I’m not going to ramble on about the actual laying out and felting of the vest, suffice to say that while it did take me two full days to felt it properly I loved the whole process and am so pleased with the result, the vest actually feels a little like soft suede! Each of my crossway measurements ended up the exact size I had wanted (to the mm! ), neck, shoulders, armhole, waist and hips, strangely enough the length didn’t shrink quite so much so I’m thinking that must be something to do with the fibre, alternatively maybe I needed to roll it a little more in this direction. I actually love the longer length anyway, when I make another vest (I’ve already had a commission, thanks Mary!) I’ll just need to take this into account when calculating the dimensions of a new template. I’d really like to thank my local Arts Office and Carlow Co Council for awarding me an Arts Act Grant to go towards funding the cost of this masterclass. It was a wonderful experience, I feel that I learnt a lot and really have a far greater understanding of how I can translate some of my sculptural ideas into practice! I’ll leave you with two pictures of the almost finished vest, although it does fit well now I just want to try it on with a light woollen polo neck and tighten up around the armholes a little. 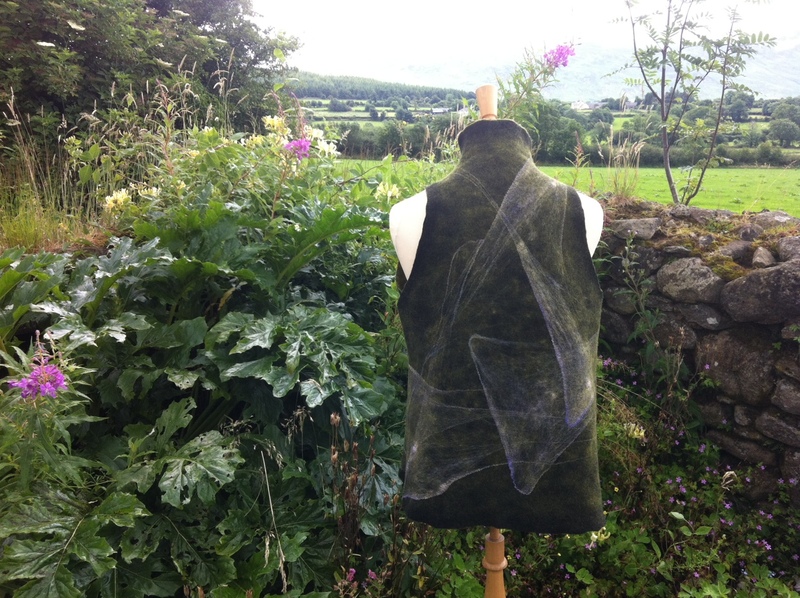 This entry was posted in Felt, workshops and tagged Dagmar Binder, Dagmar Binder workshop, Felt, felt vest, Felting, felting workshop, sleeveless felt vest, wet felting by Nicola. Bookmark the permalink. A really wonderful piece, Nicola and as i said in FB too..I’m lvoing seeiong these posts and reading the details. I am wanting to get more precise about measurements (I think!) so this is inspiring me! I love the the silk hankies on the back – they make a stunning design. It looks very professionally finished and will be a good advert for your felt when you wear it at Borris Market and Duckett’s Grove, and you should get more commissions when people see it. That is a stunning looking vest, I am so impressed!!! The style is wonderful And the colours fabulous, great work, you must b thrilled! 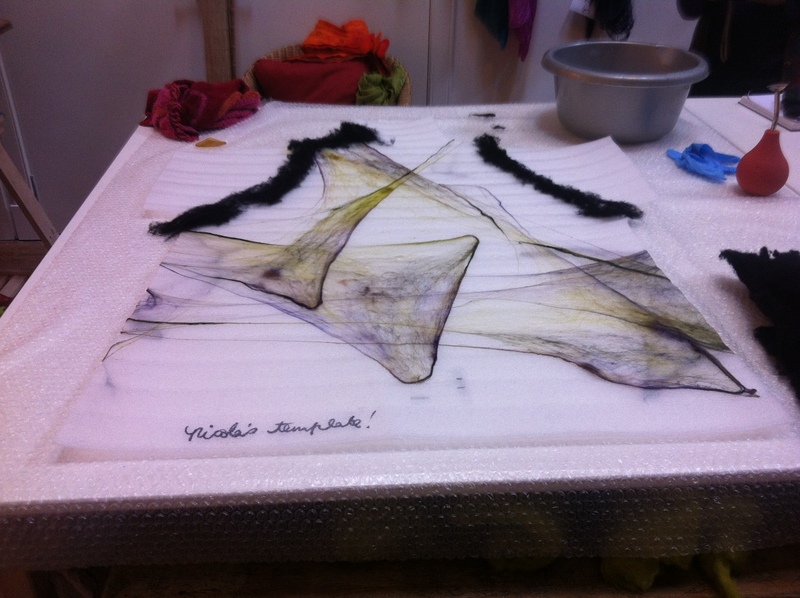 The stretched silk hankies look like a fashion designer’s sketch ! Very soft reversible vest! Loving it. This vest is super!!!!! Really a classy design……..
Beautiful. I love the hankies…my next project i will dye some of my hankies that blackish color. It will be a long while before i start measuring! So happy that you were awarded this grant. Couldn’t have been given to a more deserving person…You educate so many, and pass along your love of all things felt, through your blog. Much deserved!! Really, really beautiful and elegant. Never really knew what one could DO with silk hankies – another thank you to You! WOW. That is amazing!I love the way pattern is on the back. Hankies?